On Thursday June 9th, Oslo’s Bislett Stadium will host the world’s greatest track and field athletes on the fifth stop of the Samsung Diamond League tour. Usain Bolt will be this year’s marquee attraction. But last Sunday afternoon the legendary athletics and ice-skating arena, tucked neatly into the heart of the Norwegian capital – call it the Fenway Park or Wrigley Field of T & F – hosted the Holmenkollen Relay, the largest relay footrace in the world. If you ever wanted to experience the entirety of the Oslo running community in one place, this would be your event. It was a long 22-hours back from Oslo to San Diego yesterday, only to hear of the tragic passing of 2008 Olympic marathon champion Sammy Wanjiru of Kenya upon my landing. Here I was returning from a memorial service for one of the greatest champions in athletics history only to be greeted by news of the premature death of yet another. And though the passing of Grete Waitz at age 57 to cancer was tragic and all too soon, the news of Wanjiru’s sudden, violent end following a domestic dispute at his home in Kenya at age 24 was, in its own way, even more shocking and senseless. Oslo, Norway – After the emotional tribute to his wife Grete at yesterday’s memorial service at Bislett Stadium all Jack Waitz was in search of tonight was a quiet dinner. We met at my hotel, walked a short distance north before hopping an Oslo city bus to the St. Hanshaugen neighborhood a few kilometers away. 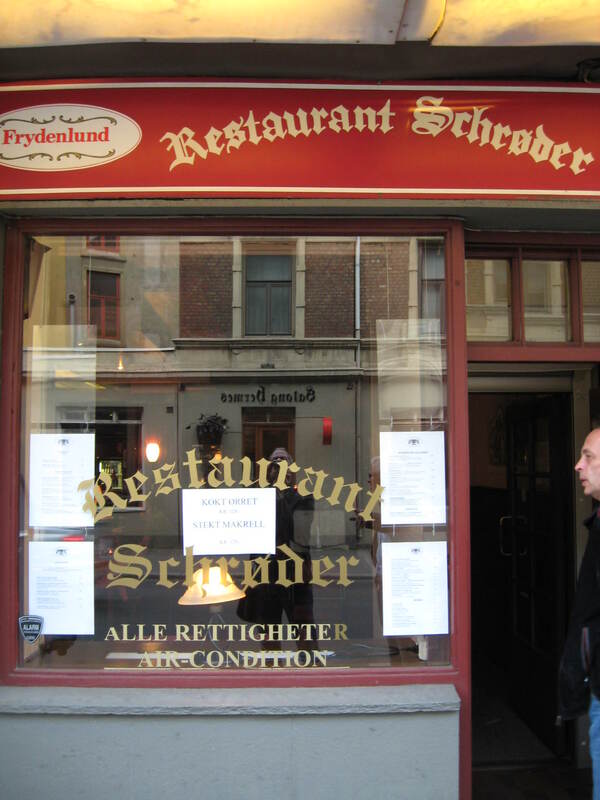 We disembarked at Restaurant Schroder, a tidy neighborhood joint with a dark wood interior. “Schroder’s is one of the city’s old-fashioned ‘brown restaurants’,” Jack explained as the bus pulled away leaving a plume of diesel fumes. So-called ‘brown restaurants have held firm against the wave of renovations sweeping Oslo, still serving traditional, inexpensive Norwegian fare. Then again, with the kroner-to-dollar exchange rate hovering around five-to-one, inexpensive is a relative term for any Yank in Norway these days. When we walked in one of the current co-owners, a Pakistani native named Ali, greeted us warmly — seems Jack and Grete’s older brother Jan Anderson are frequent patrons. Jack introduced me, and told Ali I was an American interested in history. “Would you like to try our most popular dish?” offered Ali. Nesbo’s eight work canon includes titles like The Devil’s Star, Nemesis, The Redbreast, and The Phantom which had just been published this spring. Nesbo is being touted as the next Stieg Larrson, the best-selling Swedish author behind the Millennium series of detective novels like The Girl with the Dragon Tattoo. With Nesbo’s books growing in readership, business at Schroder’s has jumped markedly. 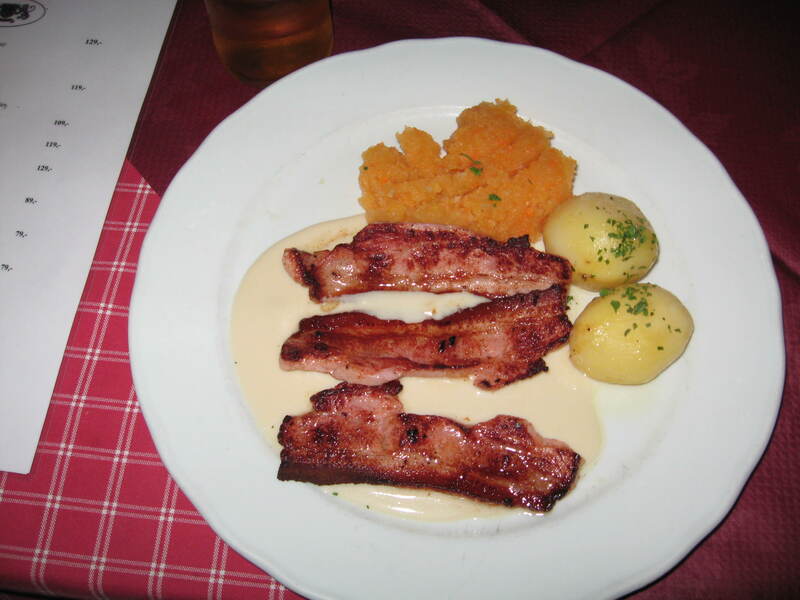 Minutes later Ali returned with a plate of Stekt Flesk Og Duppe, translation: Less Salted Side Flesh, which looked like thick slices of bacon served with white sauce, mashed turnips and potatoes. The name alone had dusted my pallet a tad, but I looked down at the plate nonetheless with an open heart. Then I looked up at Jack. Then I assumed Grete had never dined at Schroder’s –- nor often allowed Jack to. I also began to understand why policeman Harry Hole had begun drinking. Notwithstanding, according to Ali this dish made up 60% — 70% of his business. After finishing our beers — but not the less salted side flesh — we walked a few blocks up to Albertine’s, a confusingly named restaurant serving Indian fare. There we ordered our dinner, including two more beers. But when the young waiter returned, he carried on his tray what looked like two magnums of champagne. Fortunately, the bottles, though resembling champagne, contained nothing but thirst-slaking lager. After an excellent curry dinner we walked casually back to my Royal Christiana Hotel in city center, passing through narrow city streets and an urban college campus along the way. Jack said he would return tomorrow morning for us to go visit the golf course he helped design and build outside town. In the 1990s Niles Fearnley was an All-American javelin thrower and school record holder (244’8”) for the USC Trojans. It was there that he met his American wife Cindy, herself a swim star from Minnesota. 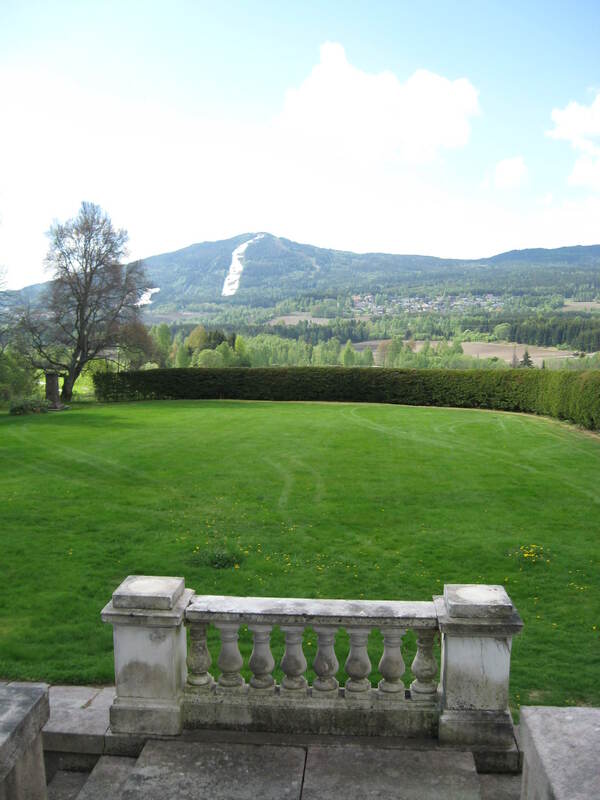 After graduation they returned to his native Norway to take control of Nils family’s large land holdings in Hakadal, 33 kilometers north of Oslo. In 2000 Nils and Jack began collaborating on the planning then building of the Hakadal Golf Club on Nils property outside Oslo. When the club opened in 2005 there were 200 members. Today, that number has swelled to 1600. The Aas Gaard Farm itself, and its 18-hole golf club, sprawls out over 30,000 acres of spruce covered hills overlooking snow covered ski runs. The farm is one of the oldest and most traditional in the area, and has 70 roofed structures on it. A large man with a robust sense of humor, and a pension for chewing tobacco, Nils was welcoming his new $150,000 Toro lawn mower as we arrived. 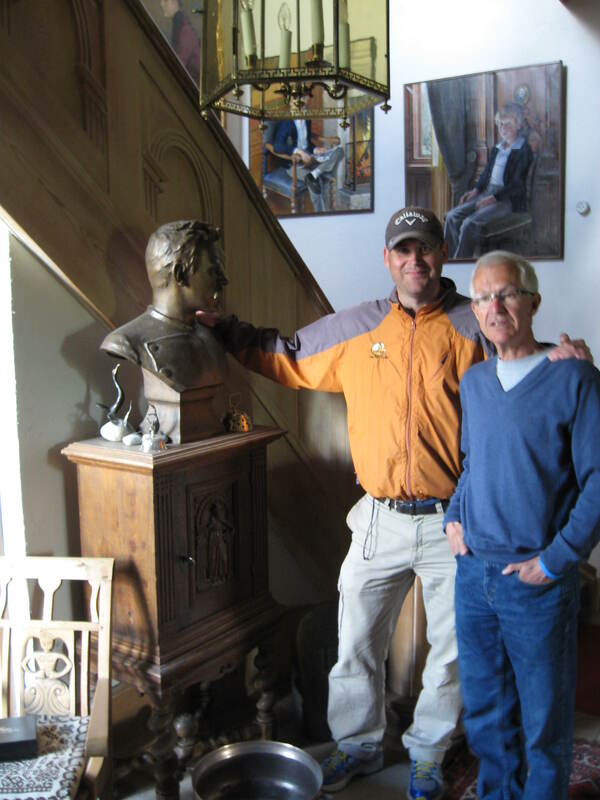 Standing well over six feet tall and weighing in at 235 pounds, Nils said he was installing a workout room as part of the major rehab he is doing on the family’s 1760 manor house. It had only one previous renovation, that back in 1860. Nils teasing masked a pain he shared with Jack. He, too, had recently lost his wife to cancer. Cindy Makens Fearnley died this January at age 38 while visiting her parents in San Diego. The couple have two young children, a boy five and a girl eight. A tour of Nils’ family home revealed an old-world elegance and charm. In the main foyer was a bust of Fridtjof Nansen, the Norwegian explorer, scientist, diplomat, humanitarian and Nobel Peace Prize laureate, whose exploits were funded by the Fearnley family. Hanging in all the rooms were a series of old paintings. One dated from the 14th century, while others, by some of Norway’s finest artists, were donated to the estate by the artists who were supported after World War II at Aas Gaard Farm when there were no painting supplies or studios anywhere to be found in wake of the German occupation. Today, the paintings those artists left to the family for its kindness are priceless. With dinner plans to attend to, we thanked Nils for the tour, promised to return for a round on the rolling 5732-meter layout at a future date, and drove back to Oslo. Along the way Jack took me to the Keiseirlokka (Kaiser Field) neighborhood where Grete had grown up with her older brothers Jan and Arild. Today, Kaiser Field is a quiet working class neighborhood, but in the post-war years it was bustling with children, an idyllic place for a child to grow. Nearby stood Hasle Lutheran Church where Jack and Grete were married in 1975. It was exactly that type of girls-staying-in-their-place attitude that Grete’s running exploits help turn around for future generations of Norwegian girls. Tonight we will meet up with Grete’s brother Jan for dinner at a restaurant near the Royal Palace that Grete, herself, enjoyed. I assume we won’t be ordering the Stekt Flesh Og Duppe. Oslo, Norway – Perhaps it was a good thing Grete wasn’t still with us, because last night in Bislett Stadium where the great Norwegian champion first came to national then international prominence, she was eulogized to over 1500 people by the likes of the Norwegian Prime Minister, the mayor of Oslo, the head of the Norwegian Athletics Federation, fellow champions, and the president of the New York Road Runners. Knowing Grete, the private person who shunned personal recognition, the public display of it all would have been pure torture. Her husband Jack joked to me earlier that “Grete will come back and haunt me” if he made the commemoration too elaborate. But both Grete and Jack came to the realization long ago that she wasn’t just a private citizen of Norway alone. The one-time school teacher from Oslo had long since become a citizen of the world, and the world needed to say good-bye and thank you. Oslo, Norway- Next Tuesday May 17th Norway will celebrate National Day, commemorating the signing of its constitution in 1814 which declared the country to be an independent nation free from Swedish rule. All over Norway children’s parades will be the central expression of the celebration, with the longest parade here in Oslo where over 100,000 people will gather in the city center to participate in the festivities. Accordingly, Norwegian flags can be seen hanging prominently throughout the capital in preparation for the national holiday. I arrived in Oslo yesterday to join in another national memorial service, this one to celebrate the life of Norway’s legendary runner Grete Waitz who died April 19th at age 57 after a long battle with cancer. The nine-time ING New York City Marathon champion and four-time world record holder in the marathon was buried in a private ceremony April 28th with government honor at state expense, only the sixth woman in Norwegian history to be accorded that distinction. Sitting at the local Starbucks this morning reading the New York Times on the IPhone when a young guy sits down adjacent waiting for his double mocha latte, or somesuch. The music is particularly pulse pounding, especially for 8 a.m. I mention this in passing. “Maybe they’re trying to pump us up for Mother’s Day,” I suggest. His name was called, and we said so long. I wished him and his wife Happy Mother’s Day, then prepared to drive north to Los Angeles with Toya to spend the day with my own dear mother-in-law. Can’t be cynical about everything. Mothers come in all shapes, sizes, and ages. Fortunately, they all fit neatly into the hearts of those who love them.